Generally speaking one could say that a ‘Low Battery’ reading on our Treo is certainly not an everyday occurence – the Treo batteries actually seem to last forever. Nevertheless, as I mentioned in my Treo Essentials Guide, there are some Treonauts whose daily Treo lifestyle will be so intense from either calls or data usage that making sure they don’t run out of power will be critical. In all these instances, the single best precaution is to carry one or more spare batteries. Until now this had simply meant getting an 1800mAh Palm Treo Battery which offers an additional 6 hours Talk time and some 300 hours Standby. However, as of today I’m upgrading the main batteries (and perhaps even my spares) on both my Treo 650 and Treo 700w to the new Seidio 2400mAh Extended Battery (image right) which instantly boosts my available power by 33% to 8 hours Talk time and nearly 400 hours Standby. I can’t think of a simpler way to add even more power to your Treo and I actually wish that this battery had been released sooner. Is this a bigger battery than the original? ie does it come with a new back that lets it stick out? If it's the same size, it's a homerun! With my data connection going full time with ChatterEmail, my battery barely makes it through 1 day. Is this odd to anyone? I just figured it was normal. With no data conn, I do get 2-3 days of standby. "The size of the Seidio 2400mAh Extended Battery battery is the exact same size of the original battery, but it is slight slightly heavier due to the increased capacity." The internet is so cool. I have the Seidio battery. Very pleased, same size, but a few ounces heavier. Had a very heavy usage day yesterday (traveling, on the phone basically all day) and went from approximately 75% to 25%. (estimate from Treo battery icon). Do you work for Seidio or something? Making a little extra on the side? There have been other batteries to hit the market that offer longer life than Palm's does, and before Seidio's as well. By the way, some of the guys over at TreoCentral used a file from the 700p and customs roms so that the 650 would be able to use SD cards bigger than 2 gigs! Crazy, huh? Also, I had not before come across another higher mAh replacement battery for the Treo and after an exhaustive Google search I still can't find one. Finally, I want to be clear about my product and software review policy. I tend to only write about products that I like since I don't enjoy wasting my time or yours with products that don't merit attention. Typically only 1 out of every 10 products that I test/evaluate will make the grade and this new Seidio battery definitely gets my vote. Thanks for your review. I just got the 700w on Monday and with all my EvDo browsing, I get about a day out of it. I just ordered the battery. Sorry - I didn't mean to offend. Andrew - I consider you to be the foremost Treo authority, and half of the things you recommend I end up acquiring, I just noticed how you seem to really like Seidio's products. That doesn't mean you're on the take however, and I was joking more than anything with that insinuation. My apologies. Personally, I'm on the fence in regards to Seidio's stuff. I consider their USB charger nigh-indepspensable, but I really don't like their 2-in-1 headphones. First of all, they're little rounded plastic logo came off on the first day of using it(which just doesn't scream "quality" to me), and I found the sound quality to be lesser than those of Palm's on 2-in-1 combo(which I believe were made by Sennheiser). Also, there was just too much weight on my ears for them to be very comfortable, so I opted to go with Palm's headset instead(regardless of the cord sometimes getting tangled). I might try one of those new ones though, as they seem to have a smaller - more logical- build. Also, I think I'll pick up that adaptor, as it seems to be more intuitive as well(seems more like an extension than an adaptor. Very cool). Sorry again for having insulted you. That was not my intention. s.elements - thank you for the link and the apology. I am glad to have clarified that there had not previously been another 2400mAh replacement battery released and that this one is the highest capacity available anywhere today. 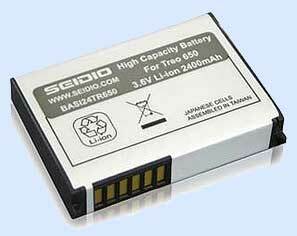 Other than that, the I find the Seidio battery to be at a great bargain for the price (esp. in comparison to "other" replacement batteries). Glad we can agree that although this new Seidio extended battery is NOT the first extended battery to the market, chances are it's the best. Peace out. Any issues with compatability? No issues with the battery meter, charging, stuff like that? The Seidio extended battery is fantastic! Using push email drained the OEM battery in a day. Using the Seidio I've gone all day and I'm still at 60%. An IT friend at work has a Treo 650 (as do I). He just got the new Seidio 2400mAh Extended Battery and is having a problem. The problem is that the battery will never show 100% full on the battery meter. Even after a full charge several times, the most the battery meter ever reads is 85%. Anyone else notice this problem? Is there a way to use this Treo as an EVDO interface for a computer? That is, can it be connected to a notebook computer, for ex, via USB or other interface to allow me to use this phone instead of buying an EVDO card for my computer? I WISH I had 300 hours standby. I'm lucky to get 16 - 24 hours standby. My phone was fully charged last night before going to bed at 11:00 last night. This morning, at 7:30, I received a critically low battery warning. I don't text message, I don't browse. This is a phone with an address book, and some pictures on it. That's it. I know I don't use it to its full potential, so I don't know why the battery charge life is so short. Hubby's is pretty much the same. We'll definitely have to look into the extended battery. It would be nice to have it last through the night. Something is badly wrong if you had a fully-charged phone that was critically low when you woke up the next morning. Is your bedroom in a poor reception area? It will run the battery down for the phone to be constantly searching for a network, finding it, losing it, and starting the process over. Also, it is possible to leave certain programs running in the background--like PocketTunes, for example--without knowing it. That will drain the battery. Finally, check to see if you have Bluetooth enabled. If you aren't using a bluetooth headset you should disable that function to conserve battery life. You may also save a bit of energy if you disable IR "beaming" until you need it. Last tip, if you have your "push" email enabled have your Treo check less often; that will also save batteries. Looks like Sedio has the new 2400 mAh battery for the 680 - http://www.seidioonline.com/index.asp?PageAction=VIEWPROD&ProdID=598 - however it takes away the slim look of this phone. I would be happy with 1800 or 2000 mAh to keep the profile down a bit; but I'll most likely pick up the extended life battery if the battery calibration steps do not work. Loosing Weight fast is one of those subjects that never seems to go out of style. There are many ways to lose weight fast but few of these approaches have lasting results. Many people choose a quick method even though they know that the pounds might creep back on for a few reasons. The desire to lose weight fast is strong but the need to keep the pounds off is even stronger. Anyone having a problem with the 2400mAh extended battery losing its charge repeatedly. My fully charged battery appears dead at times and I have to remove it and reinsert it to get the TREO to work again. I just returned it and hopefully this solves the problem. This does not happen with the original battery. I have a TREO 700wx. It hardly holds a charge for half a day. I do make a lot of calls and am on email all day. I need a solution immediately. I will be very busy in the next few weeks and not near electrical power and need reliability with battery life. Do I need to move some programs to the card, or do I just need a better battery. Please advise!!! I bought a longer life battery from ebay, which isn't this battery, but is supposedly another extended battery with 1300mah, and it seems like it might be causing my treo to crash.. I'll have to give it another week of using the regular battery again to see if the crashes go away, but sometimes on a crash it won't even start up again until i put the standard battery back in.. anyone having this problem with another brand of extended battery? does this one work ok?